Does a shareholder in a company have a claim against a director or third party who committed a wrong against the company and so caused a diminution of the value of shares in the company? This was in issue in Itzikowitz v Absa Bank Ltd (20729/2014)  ZASCA 43 (31 March 2016). The scenario was the following: Mr Gary Itzikowitz is the sole shareholder of Compass Projects (Pty) Ltd (Compass). Compass, in turn, holds 17.29 per cent of the shares in a public company, Quantum Properties Group Limited (QPG). QPG held 100 per cent of the shares in A Million UP (Pty) Ltd (AMU), a property development company. Compass had a loan account in AMU from which it is owed R5 292 442. Absa was the banker to AMU and QPG and had extended loan facilities to AMU. After June 2010, Absa increased the loan facilities to AMU to over R500 million. Two years later AMU was hopelessly insolvent and Absa obtained a final court order for its liquidation in August 2012. 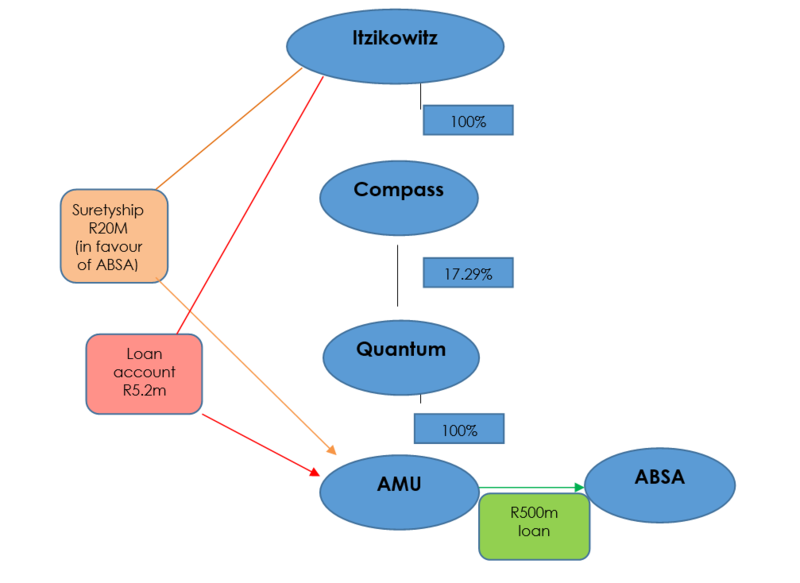 Absa subsequently sued Mr Itzikowitz for R20 million, on the basis of a suretyship signed by him in 2008, binding himself ‘as a surety and co-principal debtor jointly and severally’ together with AMU in favour of Absa. The suretyship was limited to a maximum of R20 million plus accrued interest and costs. In response to Absa’s claim Mr Itzikowitz filed two counterclaims. He alleged that AMU’s demise was a result of intentional, reckless or negligent conduct by Absa in: (a) advancing funds to AMU when there was no reasonable prospect of the monies being repaid; (b) colluding with directors of QPG and AMU, and the auditors of AMU, to ensure that they advanced Absa’s wishes to the detriment of AMU; (c) colluding with AMU’s joint venture partner, Protea Hotels, to secure benefits for it at the expense of AMU; (d) ignoring the appellant’s written request in September 2011 to cease advancing funds to AMU; and (e) setting aside the attempted business rescue and then applying for AMU’s winding-up. As a result of AMU being wound up, so the allegations go: (a) the value of QPG’s shareholding in AMU had been reduced to nil; (b) trading in QPG shares was suspended by the Johannesburg Stock Exchange; (c) the value of Compass’ shareholding in QPG was reduced to nil; and (d) Compass’ loan amount in AMU amounting to R5 292 442 was rendered irrecoverable. By way of his counterclaims the appellant seeks to recover from Absa the amount of the reduction in value of his shareholding in Compass, alleged to be R50 002 338. Mr Itzikowitz’s counterclaim B, which was pleaded in the alternative, was based on the same allegations of misconduct by Absa as in counterclaim A. However, here he relied on the provisions of s 218(2) read with s 22(1) of the Companies Act 71 of 2008. He alleged that the devaluation of his shares in Compass qualified as ‘any loss or damage’ contemplated by s 218(2) and that Absa’s conduct constitutes a breach of s 22(1). This, so the allegation went, permited him to recover the devaluation directly from Absa. The judgement did not deal with counterclaim B and for purposes of this summary we will therefore only focus on counterclaim A. In contrast to cases of physical harm, conduct causing pure economic loss is not prima facie wrongful. The onus was therefore on Mr Itzikowitz’s to show that his right/s and/or legally recognised interest/s were infringed by ABSA. As it was recently put by the Constitutional Court in Country Cloud Trading CC v MEC, Department of Infrastructure Development, Gauteng  ZACC 28; 2015 (1) SA 1 (CC) para 43: ‘Until we are satisfied the department wronged Country Cloud, its claim does not get off the ground’. In its defence ABSA contended that damage, if any, could only have been suffered by AMU and not be Mr Itzikowitz who is ‘a shareholder thrice removed from that company’. a shareholder does have a general right of participation in the company’s assets, but this right is deferred until the company is wound-up and will then also be subject to the creditor’s claims. If the company suffers a loss caused by a breach of a duty owed to it only the company will be able to sue in respect of that loss. The shareholder will not be able to sue to make good a diminution in the value of its shareholding where it merely reflects the company’s loss (i.e. if the action against the responsible party would result in the company’s assets being replenished, the claim will lie with the company and not the shareholder). If the company suffers a loss but has no cause of action to sue, the shareholder may sue in respect of the loss but only if he has a cause of action to do so. This is the case even if the loss is a diminution in the value of the shareholding. If the company and the shareholder each suffer a loss caused by breach of duties independently owed to each party, each party will be able to sue for recovery of its loss. They will, however, not be able to claim in respect of any loss caused by the breach of a duty owed to the other party. In short, the Company is therefore the only entity which can claim for the loss caused by a breach of duty owed to it. The shareholder will only be entitled to claim in the event of a breach of a duty owed to the shareholder, even if it amounts to a claim for loss of diminution of value in shareholding. The court ruled that Counterclaim A falls squarely within the ambit of type 1 of the Johnson Categories. It therefore ruled that Mr Itzikowitz is not entitled to sue to recover the diminution in value of his shares in the absence of a breach of a duty owed to him. In terms of section 163 the court can be approached for relief against oppressive or prejudicial conduct as well as conduct which disregards the interests of the applicant unfairly. Such conduct need not necessarily be unlawful. It is important to keep in mind that this section does not abolish common law remedies (as is the case with section 165, referred to below). This section can be relied on under circumstances where the action of the company or related person results in oppressive or unfairly prejudicial conduct or where the business of the company is carried on in a manner which is oppressive or prejudicial to, or unfairly disregards the interests of a shareholder. The exercise by a director or prescribed officer of a corporate power will also, in most instances, be considered an act of the Company. Section 165, in contrast to section 163, abolishes and replaces the common law derivative action. However, this relates only to wrongs committed against the company and will not limit the shareholder’s right to institute action in his own right should his interest be infringed. In terms of section 165 any shareholder, director or registered trade union is entitled to serve a demand on the company to commence or continue legal proceedings, or take related steps, to protect the interests of the company. The Company will then be granted 15 business days to apply to court to set aside the demand on the grounds that it is frivolous, vexatious or without merit. The Act in section 165 (4) prescribes the procedure which the Company must follow in the event of the demand not being set aside. The party who served the demand is then entitled to approach the court for leave to bring or continue the proceedings in the name of and on behalf of the company. The court will only grant leave under specific circumstances, including cases where the company did not adhere to the steps required in terms of section 165 (4) and only if the court is satisfied that the applicant is acting in good faith. The proposed proceedings involve the trial of a serious question of material consequence to the company, and it is in the best interests of the company. Section 218(2) reads: ‘Any person who contravenes any provision of this Act is liable to any other person for any loss or damage suffered by that person as a result of that contravention.’. Section 22(1) reads: ‘A company must not carry on its business recklessly, with gross negligence, with intend to defraud any person or for any fraudulent purpose.’. Steenkamp NO v Provincial Tender Board, Eastern Cape  ZASCA 120; 2006 (3) SA 151 (SCA) para 1. See also Minister for Safety and Security v Scott & another  ZASCA 84; 2014 (6) SA 1 (SCA). Dadoo Ltd & others v Krugersdorp Municipal Council 1920 AD 530 at 550. The Shipping Corporation of India Ltd v Evdomon Corporation & another  ZASCA 167; 1994 (1) SA 550 (A) at 566C-D.
 S v De Jager 1965 (2) SA 616 (A) at 625. 1 All ER 481;  2 AC 1 (HL). Visser Sitrus (Pty) Ltd v GOede Hoop Sitrus (Pty 0Ltd and others 2014 (5) SA 179. Itzikowitz v Absa Bank Ltd (20729/2014)  ZASCA 43 (31 March 2016) footnote 14.